However, one of my children have decided to start collecting stamps and thus continuing the family tradition (starting from my dad). 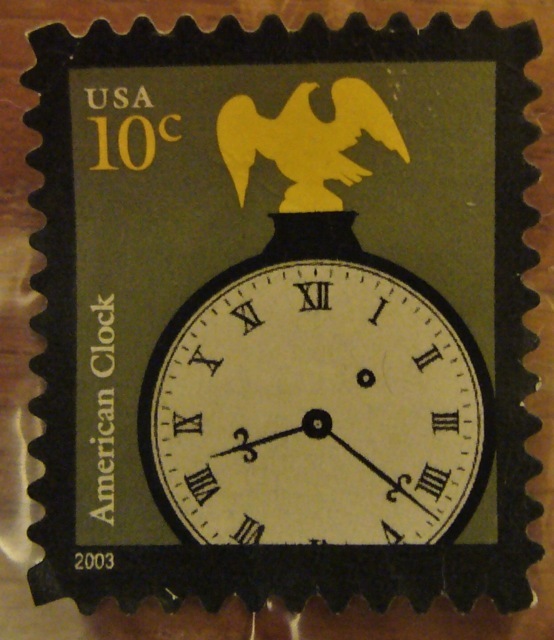 One of the stamps we got recently was an American stamp with a clock on the face. Interesting. I did some research and found out the stamp was issued in 2003 (January 24). On the face of the stamp is an artistic rendering of the face of a banjo clock made in 1805 by Simon Willard of Roxbury, Mass. The clock was for home use but soon found its way into schools and offices all over America. The clock in the stamp depicts the cloak's painted iron dial, Roman numerals hour markers and a keyhole (between 1 and 2 o'clock).